Project by: James Yeung, Master in Electrical and Computer Engineering, 2010. The goal of this project was to install and set up an operating system with real-time capabilities to work with Photonfocus' TrackCam and SiliconSoftware's MicroEnable Frame Grabber. This is the continuation of earlier work done with the same hardware but on Windows instead. So what is a real-time operating system? A key characteristic of a real-time OS is the level of its consistency concerning the amount of time it takes to accept and complete an application's task; the variability is jitter. A hard real-time operating system has less jitter than a soft real-time operating system. The chief design goal is not high throughput, but rather a guarantee of a soft or hard performance category. A real-time OS that can usually or generally meet a deadline is a soft real-time OS, but if it can meet a deadline deterministically it is a hard real-time OS. There are currently two main methods of implementing a real-time operating system, a micro-kernel approach and a scheduling approach. We will be using an operating system which implements the scheduling approach because it is the operating system that the makers of TrackCam supports. In the micro-kernel approach, there's simply a very small, simple, real-time operating system underneath the main operating system. The main operating system becomes a task run only when there is no real-time task to run, and the micro-kernel will pre-empt the main operating system whenever a real-time task needs the processor. RTAI and RTLinux (not to be confused with the linux-rt patch) are examples of such implementation. In the scheduling approach, the operating system has a scheduling policy where when a task starts running, it continues to run until it voluntarily yields the processor, blocks or is preempted by a higher-priority real-time task. This is the first-in-first-out policy. Another common policy uses a timeslice model where tasks are allotted timeslices based on their priority and run until they exhaust their timeslice. The -rt Linux patch is an example of the scheduling implementation. The scheduling in linux-rt has a total of 139 levels. The lower the level, the higher the priority it has. Level 100 to 139 maps to the -20 to 19 niceness levels. Nice is a program that allows you to manually set the priority of a particular process, but it only gives you access to the highest 40 levels. If you want access to the lower levels (higher priority levels), you will need to use the function "sched_setscheduler" in the "sched.h" library (see example code below). Since SiliconSoftware provides drivers and support for the -rt Linux operating system, we will be using it for this project. Below is a list of hardware that we will be using. For those who are not familiar with Linux, or how an operating system works, here is a quick run down on the basics. Linux is really just a kernel. A kernel is a piece of software that handles the interaction between hardware and applications. All the different kinds of "Linux" out there like Ubuntu, Fedora, openSUSE and Debian all have basically the same kernel, with a few tweaks here and there. The main difference between them is the GUI that is on top of the kernel, which gives them each their distinct look and feel. We will be using openSUSE because it has been tested by SiliconSoftware with their MicroEnable Frame Grabber. Use an openSUSE Live CD to install a fresh copy of openSUSE. In this guide, we will be using a 64-bit version. Follow on screen instructions and note the root password that you set. When prompted about partition setup, be sure to use file system format “ext3” for the swap and home partitions. The version of the kernel that we will be building does not properly support “ext4” (or higher). Check what is the newest version of the kernel that is supported by linux-rt and other applications/drivers that you will be using. In this guide, we will be using version 2.6.24.7, the highest kernel version that our frame grabber software was tested on. Open a terminal window. GNOME Terminal would do. Go into superuser mode. You will need to know the root password. Go into the directory where source code is commonly stored. Download the linux-rt patch for the matching kernel. Copy the config file provided with the menable driver. When prompted, use default by pressing enter. Except you need to set "High Resolution Timer Support" to "Yes". If you know which modules are needed for your hardware, enable them. If you don't know which modules are needed for your hardware, compile the kernel and error messages from your attempt to install will give you a better idea of which modules need to be enabled. Type “vi scripts/unifdef.c" to view and edit the file. If you didn't enable all required modules, you will get error messages hinting which ones you need here. Make sure “fstab” has correct paths. If not, change the part after “/dev/” to “sda#” where # is the corresponding number to “-part#”. You'll need to change the grub config file to match the changes in fstab. Grub is the software that controls which OS to boot into during boot up. You may also want to edit the menu.lst file to your desire. We will be using menable_linuxdrv_3.9.10 with the 2.6.23.7-rt17 kernel. Go into the root of the driver folder. We need to copy the binary objects from the subdirectory matching our kernel and architecture. Go into the direction with the RPM packages. Install the two rpm packages. Use the following commands to see where the files should have been installed. Go into the directories and see if they are there. Make sure the following packages are installed. Download module “FindOpenCV.cmake” and add it to cmake. Download and place file into /usr/share/cmake/Modules. Download OpenCV source code, configure, compile and install. (Optional) Go through the “Hello World” tutorial to make sure it works. This section was an attempt to see how "real-time" the operating system is. Cyclictest is program available on the rt-wiki for testing the latency of commands on your operating system. All the code and instructions are available on their website. I found a "Hello World" code for real-time applications on the -rt Linux patch online. I then modified the code such that it would have the highest possible priority (1) and that it would take a snapshot of the timer every 10ms. This is a test that uses multiple threads where only one is set with a high priority and the rest are normal priority. The high priority thread is also reading one analog signal from a data acquisition card and writing one analog signal to an output card. In this particular test I had four normal priority threads, each continuously performing of the the basic simple math operation (+, -, *, /). This was then tested on a system with a quad core CPU. The four normal priority threads is to ensure that there are more than four active tasks for the CPU to handle. In a true setup, a total of two threads may be enough for your needs. More details about the cards used in this test can be found here. You can download a sample of results here. To ensure that the operating system is truly "real-time", I ran the two tests (Cyclictest and Homemade Test) under two conditions, load and no load. The no load condition is simply where except for system processes, only the test programs are running. The load condition is where I compile the source code of OpenCV and the Linux kernel using a niceness of -20. As for the PThread Test, it was run under the no load condition. Using the Cyclictest program, I was able to get some very nice results. The most important number to note in the results is the max because in order to assure hard real-time performance, the system should never have a latency greater than a certain threshold. That threshold would be determined by the frequency of the task that you are trying to perform. For example, if you wanted to perform a task at 100kHz and the worst case latency is 5us, then your task should take no more than 5us since there are only 10us between each consecutive tasks. It is interesting to note that when using a priority level of 1 in Cyclictest, we get a much higher max than a priority level of 2 or 80. I still don't have a reasoning for this, but this phenomenon is also apparent in the Homemade Test and PThread Test. The results of this test can be summarized and better visualized in histograms. Below are two histograms from each of the two conditions. It is important to note that these tests were performed with priority level set at 1. The PThread test is a better measure of how real-time the system is. 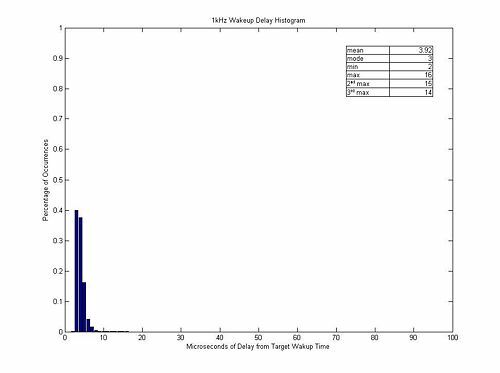 Latencies between target time stamp and recorded time stamp under no-load conditions. Intervals between consecutive time stamps under no-load conditions. 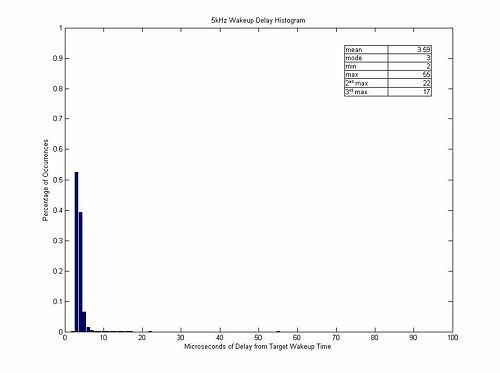 Latencies between target time stamp and recorded time stamp under load conditions. Intervals between consecutive time stamps under load conditions. The PThread was run on four different frequencies, 1kHz, 2kHz, 5kHz and 10kHz. Each frequency was tested for 5 hours. I have decided to run the test with the priority level set at 2 due to the unexplained phenomenon of a higher max latency at priority level 1 experienced in the Cyclictest. The graphs below show a histogram of latencies experienced in microseconds. I only kept count of latencies of up to 100us because a latency of 100us or greater would be considered catastrophic. Furthermore, the maximum latency experienced at the start of the test are generally high, so I have decided to discard the first hour as warm up time for the system. However, a one second warm up will be enough in practice since the max latency is experienced within the first one millisecond. The results from test are shown below. Linux-rt delay from wakeup target time at 1kHz. 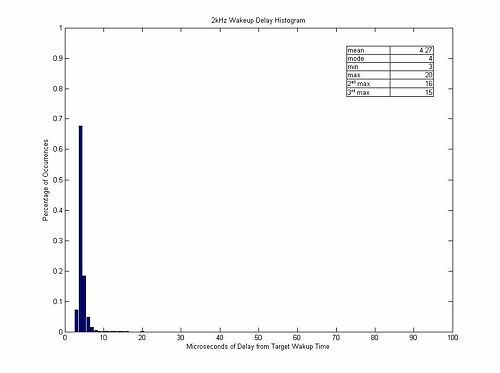 Linux-rt delay from wakeup target time at 2kHz. Linux-rt delay from wakeup target time at 5kHz. Linux-rt delay from wakeup target time at 10kHz. Here's a version of the PThread Test code that reads the encoder counts at 10kHz for 1 minute and then 5kHz at 1 minute. While it is reading, it will output motor angle at 10Hz. If you pipe this into the driveGnuPlotStream.pl script, it will plot the motor angle in real-time at 10Hz. Click here to download or for more details about the driveGnuPlotStream.pl script. Note: You will need to have the script in the same directory. Now that we have an operating system with sub 100us latency, our next step is to port the code for the camera over to the Linux side. Once that is done, we would like to be able to capture images at 1000fps or better and track the location of bright spots in the image. This page was last modified on 20 June 2010, at 22:41.